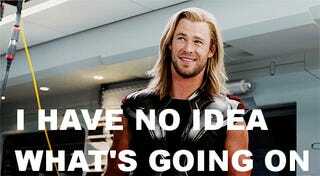 Picture will be relevant, but also: Thor. A little background: on Halloween, I went up to Mr. PKB and said, very pleased with myself, “I’m a little bit drunk!” And he smiled and said, “That’s your favorite state of being!” Which is not a good thing to hear, especially if it rings true. And it does. I like being a little bit drunk, partially because I actually super enjoy the physical sensation, and partially because it makes me feel cool, which is very appealing to a big ol’ outcast nerd like myself, and partially because I don’t have anxiety when I’m under the influence. I’ve been a little worried about my alcohol use for a while. Mr. PKB hardly drinks anymore (although apparently he was quite the fish right before I met him) and cut down because he was gaining weight. He also dislikes being out of control, and so he’ll usually have just one beer when we go out, if that. In comparison to him, I drink a lot. In comparison to other people, I don’t. I usually have a glass of wine or two after work, and I’ll get drunk at parties with my friends, which typically amounts to once a month or less. But it had gotten to the point where I was looking forward to weekends where I could sit home alone and daydrink and knit, and the thing in my head that should say “it’s time to stop” doesn’t kick in most of the time. (In terms of volume, that’s about drink two—three in about four hours is too much for my body and tolerance.) In any case, it’s not really about the volume, it’s about the relationship. My family also has addictive tendencies, and I don’t want to be the kind of person who can only handle stress by drinking, or who even has the habit of handling stress by drinking. The idea makes me extremely uncomfortable. Long story short, I wasn’t happy with my relationship with alcohol, and that moment of uncomfortable truth made No-Drink November an easy choice. So here’s my initial report: Good news! I’m in way better shape than I thought I’d be in. I do miss the ritual and the taste of a drink, but I don’t miss the alcohol. If I could get a virgin martini (AHAHAHAHA), I would very happily drink that instead. Instead I’ve been engaging in the ritual by making mocktails with seltzer and aromatics. The good: I’m not longer feeling the judgment of my mental illnesses. I’m also actually just clumsy and droopy when I’m tired, so my nighttime tripping, dropping things, and not remembering stuff is just my brain not knowing how to brain, and not a sign of alcohol abuse. The annoying: All the benefits people talk about from quitting drinking are not showing up. I’m possibly more tired than usual, I’m still thirsty all the time (not diabetes, we’re just in LA’s windy season which turns all residents into desiccated husks, ready to blow away and spread our seeds into unforgiving soil), I’m not sleeping noticeably better, my skin hasn’t cleared up, and neither mental illness has changed status. I’m possibly sleeping more deeply, but all that’s done is give me weird, exhausting dreams where I’m trying to do something or get somewhere and can’t. Also, when I tell people I’m doing a No-Drink November, they think I’m pregnant. I am definitely not pregnant. The good thing about all those annoying parts is that it shows my body isn’t hugely affected by alcohol, so my usage levels are physically fine. I also had a physical with a ton of bloodwork in the spring, and I’m in tippy-top health. The bad: There really is no bad. I went to a James Bond viewing party in celebration of the new movie and it was a little bit of a bummer to not have a thematically appropriate martini, but it wasn’t a big deal. (Except for having to convince people I’m not knocked up. That’s super annoying.) I’m eating a little more sugar, I guess? Meh. No real bad. Other thoughts: being a sober person around drunk people can verge on both boring and hilarious. Wine smells objectively good. American alcohol culture is fucked up. I have now proved to myself I can deal with stress without substances. 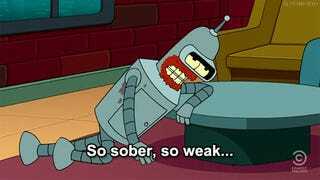 I just have to accept I have a lower tolerance now than I used to and actually make conscious choices about how much I drink, even when there’s a DD and I don’t have any obligations the next day. A lot of things I though were effects of alcohol are actually just me being tired and clumsy. I will always get too sleepy to drive home after midnight. How about you, GT? Anyone else doing a sober month?